At Little Mountain Veterinary Clinic we follow these elective surgery protocols for spays and neuters of dogs and cats. We recommend the correct protocols. We understand and accept that people must live within their own unique priorities and financial constraints. We do not go below the minimum standards outlined as you can see in the above slide show. 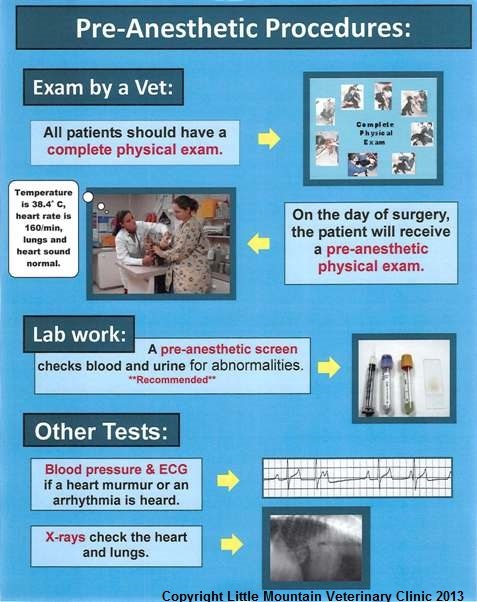 Discuss the risks with the veterinarian in the preanesthetic exam and the costs with the receptionist. Appointments are required. Our surgeries with their high standards are not at the CVBC recommended prices – they are lower. The difference is borne by the owners of the clinic. There is no subsidy of any kind (government, non-profit or other).